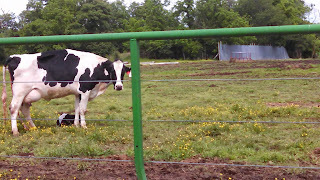 How long do a dairy cow and calf stay together? On our farm, the calf is usually with the mother for the first 12 hours after birth. The time varies depending on the time of birth. The mothers will join the milking herd and the calves are placed in an individual calf hutch to be fed and closely monitored. Calves are separated from their mothers to ensure the best individual care and monitoring of both animals, especially in the first 24 hours. Our calves grow up to become the cows that produce milk on our farm, so we make it a priority to get them off to a healthy start.